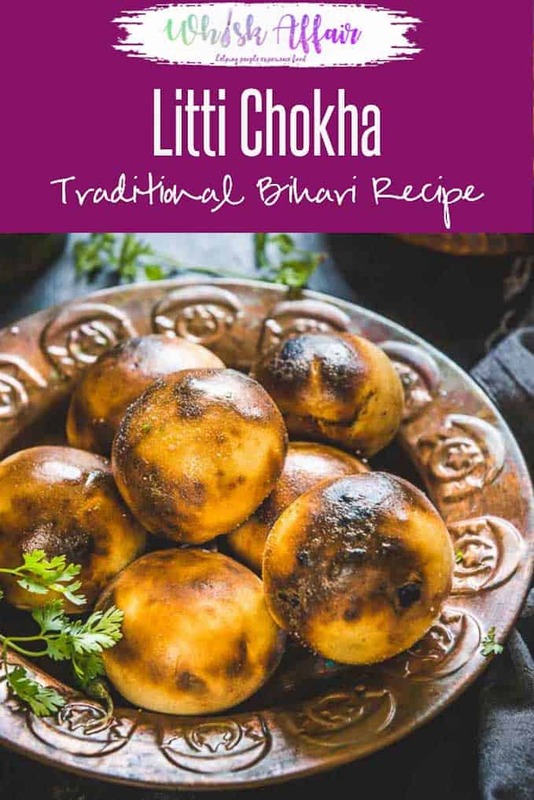 Litti Chokha is a traditional Bihari and Jharkhand dish that is quite similar to Rajasthani Baati but still very different. The litti is the bread made out of flour and is stuffed with sattu and chokha is the side dish made using eggplant, potato or tomatoes. Here is how to make Litti Chokha Recipe. 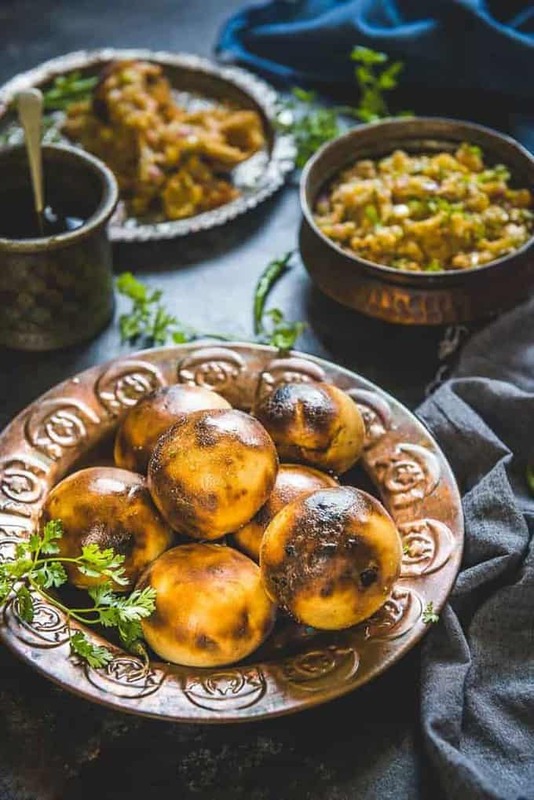 Litti Chokha is a very traditional dish that’s popular in Bihar and Jharkhand, it’s a special dish that’s made in most Bihari households and the whole family comes together to enjoy this ghee dunked stuffed wheat balls. Don’t you love it too? These authentic stuffed whole wheat balls resemble the Rajasthani Batti, but the flavours are quite different in the Litti. The stuffed whole wheat balls are referred to as Litti and the subzi served with is the Chokha. In some regions of Bihar, the Litti is also served with a spicy chicken curry. This dish was very popular during the war times as it didn’t require much water and would also stay fresh for a longer period of time. The flavours of this dish are great and the stuffing in the dough balls adds oomph of flavour to the Litti. How was Litti Cooked in olden days? Traditionally, the litti is baked in traditional fuel like cow dung and now you’ll find that most restaurants are trying to infuse different flavours while baking the Litti balls. But litti Chokha recipe can be made in over easily. You can also use convection mode to make Litti Chokha in Microwave. After cooking the litti in oven, just keep it over the direct flame to get those black blisters all around. It will not only enhance the taste, the litti will look as if it has been cooked over cow dung. How to cook Litti Chokha? To make the Litti or the wheat balls, whole wheat flavour is kneaded into a soft dough with salt, ghee or clarified butter and cooking soda.Sometimes, carom seeds or ajwain is also used to flavour the Litti. Once done, the dough is covered and kept aside for some time. The flavourful filling is made using a stuffing of Sattu or roasted chana dal flour, grated ginger, finely chopped green chillies, pickle masala, lemon juice, salt and red chilli powder. Some oil can be added in if the filling is too dry. Next the Litti is assembled by taking a small ball of dough and stuffing it with the prepared stuffing. Finally, the littis are laid out and baked in an oven till it’s browned on all sides. Then it’s lightly roasted over direct flame and dipped in ghee. A quick chokha is also prepared using roasted baigan and tomatoes. A simple flavouring of chopped onions, green chilli, chopped coriander, salt, mustard oil and lemon juice are added in to make the chokha. 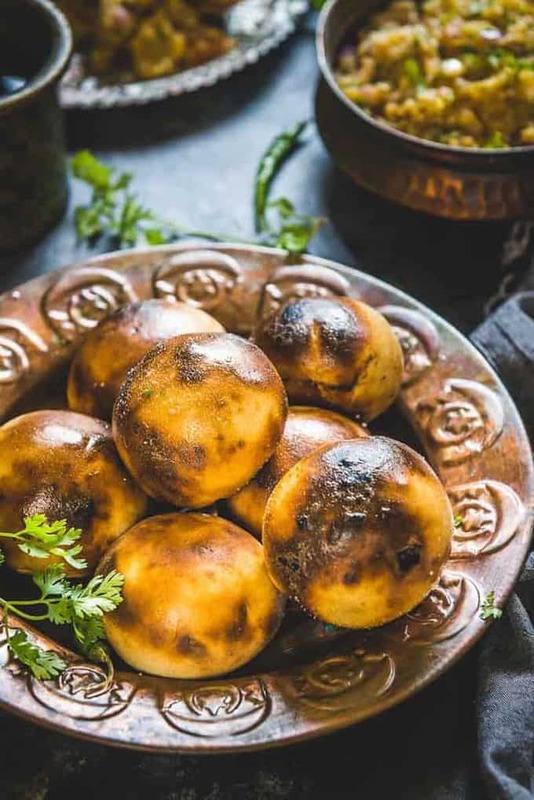 This Authentic litti chokha recipe is an extravagant dish to try at home, but your family is going to fall in love from the very first bite. What’s great about these dough balls is that the flavours come through as you bite into the stuffing. Chokha might seem a lot similar to the traditional baigan bharta, but the flavours of this dish are quite fresh. Do try this recipe at family get togethers and parties at home; this dish is definitely going to be a big hit. So waiting for what? Jump straight to the recipe. What gives it maximum flavour is the dipping of the fresh littis in desi ghee. The whole dish has a very rustic and earthy flavour to it and it might seem like a tedious recipe at first, but give it a try and you’ll enjoy how the whole dish comes together in your mouth. Here is how to make Litti Chokha in Bihari style. 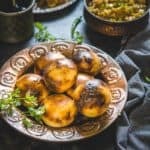 Litti Chokha is a traditional Bihari and Jharkhandi dish that is quite similar to Rajasthani Baati but still very different. Add whole wheat flour, salt, ghee and cooking soda in a bowl and mix well. Add water and knead to make a medium soft dough. Add some more oil if the filling is too dry. You should be able to bind the filling in your fist. Take out a large lemon sized dough and make it into a ball. Roll the dough ball to make a 4-5 inch circle. Keep 2 tbsp of filling in the centre of the dough and bring the ends together. Make all the lit in the same manner. Keep the litti covered with a cloth. Pre heat an oven to 180 degrees C.
Bake for 20-25 minutes until browned from the top. Flip the litti upside down and bake for another 10-12 minutes. They should be evenly browned from all the sides. Hold the litti with a tong and roast them over direct flame so that brown spots appears all over them. Dip the litti in ghee and serve with chokha. Roast the baingan and tomatoes over direct flame until nicely charred. Remove them on a plate and let cool. Remove the skin of the eggplant and tomato and mash them nicely. Hi bhabhi… Thank you for sharing the recepie.. what temperature should I set if making in a microwave and for how much time? I haven’t tried making litti in microwave, so not very sure of the temperature set up. You can set it at the same temperature you set for making cake.